More than 1 1/2 years ago, I received an email from an editor at Martingale Publishing asking if I would contribute a quilt design to an upcoming pattern book from bloggers. Of course, I was excited. This was my first big opportunity to start getting my name out there. As a blogger, I've taken a fairly low-key course. I try to minimize the extra things I'm involved in, especially with three little kiddos at home. I haven't aggressively looked for new opportunities because it's been hard enough keeping up with everything else I have going on. 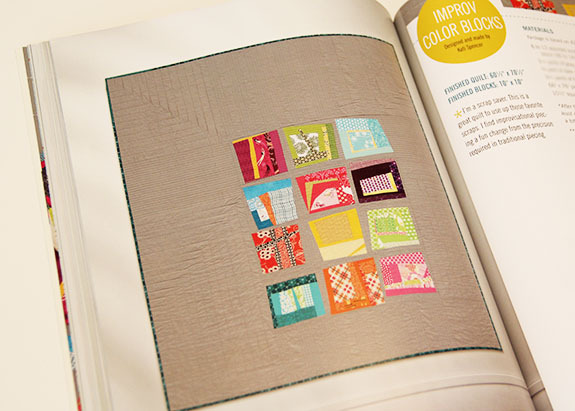 But, I immediately jumped at the chance to have a quilt in this book. There were definitely pros and cons to the experience. Rather than spend the next few paragraphs touting this book, I thought I'd review my experience more than the actual book along with a few pictures of some of my favorite quilts from the book. Over the course of the next few months, I'm sure you'll see many more reviews of the book. I wanted to take a slightly different look at what it is actually like for me to have my name in here. I've been asked several times, "How do you get published?" Basically my response is always, "Contact the editor, and submit an idea." Publishers, whether it be books or magazines, are always looking for new content. It never hurts to ask. Although, it can be really scary to ask. It was easy for me on this book since I was contacted by Martingale. When I submitted my first idea to Modern Quilts Unlimited Magazine, my heart was pounding as I sent off the email. I was terrified. What if they didn't like what I sent? What if they hated my ideas? My experience submitting the actual quilt for this book ended up being quite stressful. It came at a difficult point in my life. Lots of other things were going on. I felt like I was in a creative funk just when I had to sew the quilt to meet my deadline. I also realized I did not love my design chosen for the book. It was hard to push through and create something I wasn't "feeling". I had issues with my basting process and my sewing machine. Sometimes it seems that things just aren't meant to be. I barely made my deadline for my quilt and pattern draft. Then the pattern reviews started. Several times I received emails for clarification on my pattern, and they wanted the rewrite within 24 hours. Considering the craziness of life, that kind of turnaround is just hard. Despite the fact that this experience was stressful, it was also very helpful in the long run. First of all, I learned that I was not cut out to write my own book any time soon. I was able to get my feet wet and decided it was too much for me to handle right now. I used to think writing my own quilting book would be fantastic. It sounded really exciting. I've changed my mind about that idea for now. I've realized it is a lot of work and a lot of stress. Between my book submission and the two magazine submissions I've done, I've also learned quite a bit about the pattern writing process. This proved to be invaluable experience as I've begun writing my own patterns. I'm not sure I would have braved independent pattern writing had I not had these experiences. The compensation isn't great. For the most part, people don't do this for the money. My compensation for the Modern Quilts book covered my materials, shipping, and just a little extra. You aren't getting rich on this. What I didn't know when I made my quilt for this submission is that fabric companies are often willing to ship fabric to you for a specific project that will be published. 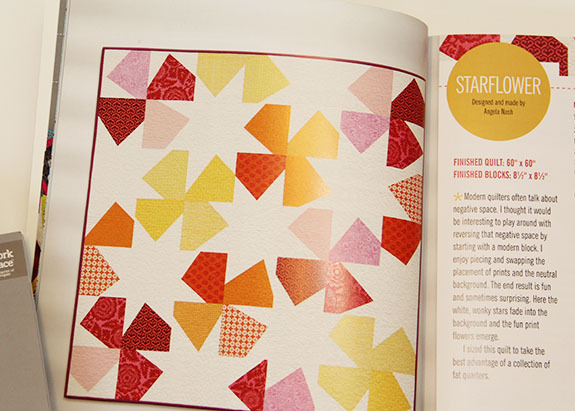 With copyright considerations, it's generally recommended to seek permission to use a specific fabric line for pattern publication. Just slip in a request for the manufacturer to supply the fabric in exchange for fabric credit in the pattern. It's a win for both parties. So after all of that, what about the book? I admit there is something really exciting about seeing my name in a real book. My mom is proud! I'm sure she even took her copy to work to show her friends. In the course of life, it's really just a little thing, but having my final copy in my hands was exciting. I was part of something fun. I'm grateful to be included in this project with many other quilters I know, admire and respect. There are some great ideas in this book. Many of them are simple and perfect for beginners. Am I in love with every quilt in this book? No. But, I can gain inspiration from each quilt in there. I love reading blogs for inspiration, but there is just something wonderful about holding a book in your hands and searching for new ideas. I own 20+ quilting books and have made just one quilt from all of them combined. I may have a different perspective than most people, but I don't buy books for patterns. I buy them for inspiration, and I browse through them frequently. My nightstand is piled with quilting books. I'm still torn on the title "Modern Quilts". The debate continues to rage about what is modern quilting. I think this will always be up for debate, and opinions will constantly change. According to the new MQG definition, many of these quilts aren't modern, but it's just one definition. I'm honestly no longer sure of my personal definition of "modern quilting". I'm changing my perspective on "modern quilting" and what it means to me to be a "modern quilter". I'm learning to quilt what I love and forget about definitions. I've been asked multiple times by friends and other bloggers about getting a project published. I am far from the expert, but I've learned it's worth asking. Despite the cons, I can look back and say this was a good learning experience for me. I'm glad I had the chance to take this risk. 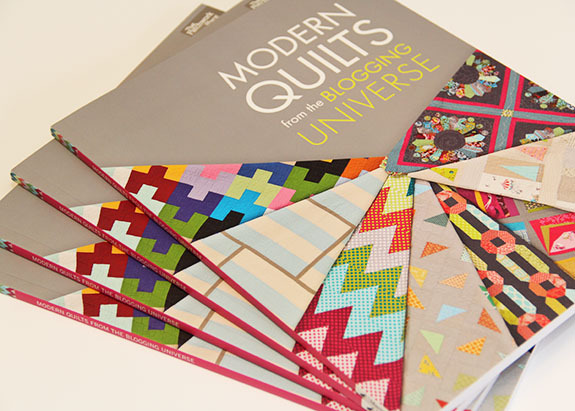 Martingale has kindly provided me with several copies of Modern Quilts from the Blogging Universe to give away. I'll be giving away four copies this weekend. To enter to win, just leave a comment. Please make sure your email is included in the comment or your profile. Random.org will decide the winners next Tuesday! I think it's great that you don't try to do everything. I really enjoy what you do post and seeing what you make. This book looks great and I'm glad you made it a learning experience! Be proud, so exciting for you! Great perspective. Thanks for the chance. I love these types of posts. Thanks for sharing. I am ambivalent about the definition of modern quilting, so I have decided I am just a quilter, like I used to be--before the modern movement. Thanks for the giveaway. I would love to win a copy of this book. well done for making it through the process and getting the pattern into the book, I have 2 kids and getting anything done when I want it done is hard work! Thanks for the give away too! Thank you for being so candid about your experience! Be proud of yourself ! It is so interesting to read the behind-the-scenes details of your experience. Thanks for sharing and for the chance to win a copy of the book! I too enjoy looking at books for inspiration. New ideas form with each turn of the page. I really appreciate your observations about the book process for you. Following and looking at famous bloggers can get intimidating, so it's refreshing to see that not everything is an automatic success for you guys. All that aside, congrats on the book! Congrats on the book! I really like that you wrote about your specific experience here. Great perspective. Great to hear your take on the process. "Modern" is only an adjective to me and it doesn't really define anything succinctly. It's destined to continue to change as time passes. Do what you love and love what you do! Limiting definitions/classifications not required:) Thanks for sharing! I also own a lot of quilting books and almost never make any of the quilts in them. But I love imagining what I could make given the inspiration form them! Good for you on the book and the learning experience- and thanks for being real and honest (as always)! I love the clean look of the modern style quilts (and the traditional ones too). Thank you for the chance to win. It's interesting to read your 'behind the scenes'thoughts on your book - Thank you! I can only imagine what it must feel like to have your quilt in a book that so many will be looking at, compensation or not - good for you! I had a similar experience, with a mag. I was contacted, and then the learning began! What a refreshing point of view on a book tour. I learned some interesting things. :)Congrats on the publishing! Thanks for sharing! I would love to win a copy !.. Congrats on being published! thanks for the giveaway! Great insightful post! You have every reason to be proud! Thanks for the chance to win a fab book. I especially like the Starflower quilt and am crossing fingers and toes that I get to win one of these. Congrats on being published in such a fantastic way. interesting post! Thanks for the chance to win a copy. I'm like you, I own lots of crafting books (including quilting ones) mostly for the beauty & inspiration. However, I do occasionally pick one & try my hand at it. Not as often as I would like though. ;) I would love this book. Crossing my fingers. I'd love to win a copy! I love modern quilts...thank you for a chance. Thanks for your insight about submitting work. And for the giveaway! Congrats on getting published! That is awesome! This book is on my wishlist because I follow many of the blogs that are represented. Actually some of the first blogs I started following were yours, Faith's, and Lee's. Thanks so much for sharing more about the experience. I think it looks so easy sometimes when you see people posting all the places they are published. I'm not sure I even aspire to get there but its good to hear what other people who have been through the process think about it. Thanks for sharing. And thanks for a chance to win. What a lovely and different post for a book review. I really enjoyed reading the insight you gave into being part of it! Thanks for the chance to win a copy. congrats on the book, & thank you for sharing such an honest & insightful post on the whole publishing process! Very refreshing to read, & one of the reasons I love your blog. thank-you for your insight! it's always helpful to learn about the experiences of others. i recently had my first pattern published in a book. the process took over 2 years from start to finish and i've learned a lot from it, primarily that i don't think book publishing is for me. Thanks for sharing your story, I have often wondered about the work involved when creating a pattern! I enjoy both blogs and quilting books, and i am often amazed with the generosity in sharing from bloggers! Kati, you shared a very real aspect of publishing. The turn around is ridiculously quick for pieces that would normally take weeks, months or years to make properly. Enormously stressful. Especially with little ones or even just a husband! lol Thanks for sharing the less than glamorous side of all this. Thanks for the insight. I have been very selective about my publication decisions for the same reasons you identify. But the book looks great and you should be proud! Thanks for the chance. Would love to win, thanks for the giveaway. I love this perspective on the publishing world. How many of us have thought, "I could write a book!" I know I have! Thanks! Thanks for the great perspective. It is always a juggle to balance work and family life and that changes over time. Good for you knowing what you want to do now and learn for it. The book looks great and you do beautiful work! Enjoy your posts, and would love to win the book! Thanks so much for the chance to win. I am so addicted to modern quilts these days! What a nice Insight. Never thought about everything behind making a book. Thank you. It was very interesting to read your perspective on the book experience. I didn't know companies would send fabric for such things. That's nice to know! Thanks for the chance to win! What a lovely quilt! Thanks for sharing your story and your talent. I have known the feeling...three times. So happy for you and I would love to win a copy. Again, congrats! Thanks for sharing your thoughts. Thanks for the chance to see your name in print. Congrats. Congratulations. Thanks for sharing your experience. Thanks for being so honest about your experiences, Kati. Congratulations on being published! I would love to win a copy! I would love to have this book in my library! Thanks! As a longtime quilter, it's exciting to see the 'younger' crowd putting their twist on traditional patterns and color choices. Keep it coming and congrats on the book. Thank you so much for your honest take on getting published! It's one of the reasons I love following your blog. I've got twin toddlers of my own, so I appreciate your outlook on life and quilting. You do what you do because you love it! Thanks for the chance to win this awesome book. This is one of the most honest and soulful "reviews" I've read lately -- congratulations and thank you. The part I like best? "I'm changing my perspective on "modern quilting" and what it means to me to be a "modern quilter". I'm learning to quilt what I love and forget about definitions." AMEN and AMEN. Labels like "modern quilting" can be useful for describing (sometimes) but I don't like the current tendency to use labels as DEFINITIONS of who we are or limiting the scope of what we do (or for any other reaso). Please keep on making what you love and loving what you make!! I am impressed with your honesty and your ability to prioritize! I also love to browse through books for inspiration! Thanks for the chance! Thank you for the candied advice on pattern submissions. I have always wondered about the process and if I would like it. Congratulation on your piece in the book! I have learned so much from following your blog. Look forward to seeing this new book. Thanks for the opportunity to win. Awesome quilt! I always wondered how much people made off of putting their patterns in writing. Quilting costs a lot more than most people think, certainly more than I thought a year ago before I started. Congratulations on having your name in print. It's really something to be proud of, and something I aspire to myself. This is a great post, thanks! I would love a copy of this book. Oh oh OH! 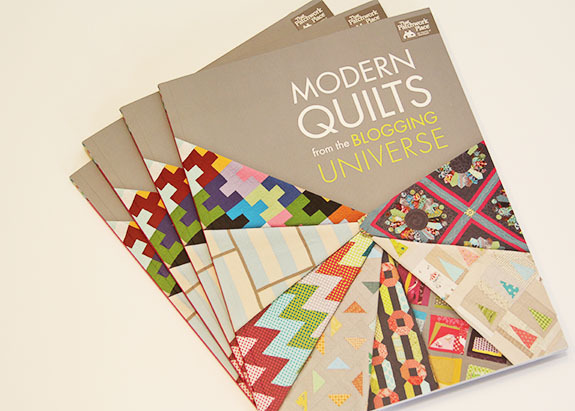 I am excited about the blogging universe quilt book. I have seen it, talked about it... but haven't yet gotten a copy. Please enter me into the giveaway. It was an interesting story about how the book came into being-thanks for sharing! Congratulations! Thanks for sharing the experience from that angle, your post was very well thought through! I agree about using books for inspiration more than patterns!! Thanks for the chance to win too!! I really enjoyed learning about your experience being part of a book, great to read a post about more than just all the beautiful quilts. Although I DO like beautiful quilts! I agree that quilt books are great for inspiration. I read them like I read cookbooks -- sometimes just to get ideas or to be entertained, rather than actually making something from them. Thanks for the chance in this giveaway! It's so great to hear your thoughts on this subject, Kati! What a great give-away. I'd love to win a copy! The book looks great. Thanks for the chance to win. thank you for your thoughts. It was really interesting to read. Reading that everything is not always fine was relieving. It isn't over here, too. Thanks for the giveaway. Good luck to everyone. I think we've all been debating the definition of modern quilting lately! I'm thinking I might start calling myself a "not super traditional quilter" haha Congratulations, can't wait to check out the book! What beautiful quilts! Very inspirational. Good for you for recognizing this as a learning experience! I have admired your blog from a distance for quite some time. I am over joyed that you have been chosen to contribute to the book. Congratulations. It's a great book regardless of your experience. As you look back, the details will fade and you'll probably feel much better about it. This is just the beginning for you!! Cant wait to see what you publish next!! Congrats and thanks for keeping the art of quilting alive and interesting! I am SO looking forward to reading (studying) this book! I have been quilting/sewing/longarming for a while now, but I am a fledgling in this Blog world. Thanks for thoughtfully writing this book! Wow, nice pattern options in this book and a great win for the lucky four. Good information about the publishing process in this particular case. Thanks for that insight. I'd love to have this book. Despite the issues your described, I think your quilt looks great and is creative, and boy have I always loved that one from Krista. Thank you, Kati, for your honest feedback on this process. It was really very interesting to read and so refreshing to see some real candor. I would love to win this book! Beautiful photos of your quilts. I LOVE the bright colors!! I generally don't buy books, and if I do, it is more for inspiration than the intent of making the quilts. I would like a copy of this one, because it would be fun to see quilts from people I actually know. Ohhh thanks for the chance!!!! Congratulations on being published. I think it's quite exciting. I have recently grown to love Modern quilts...they are so unique and different from the traditional quilts normally seen and made. In fact, I am in the process of making my very first modern quilt! Thank you for offering the giveaway! Appreciate your comments on the process. Having watched my DIL go through things similar, I admire that you are willing to put yourself out there and risk. Thanks. Congratulations! Lovely post, lovely quilt. I think that most of the things we look back on as accomplishments that give us satisfaction are often the things we spend the most energy on. Congrats! And thank you for sharing your honest experience! Thank you for an honest opinion. Even if you decide not to try and publish again, you can say "I did this!" which is more than most people can say, so go you! I'd love to get a copy of this book, thanks for the chance! I too read quilting books, thinking about what to make next. There is much inspiration to be found! So interesting to hear more about the process behind the wonderful quilting books we all love to read! Thanks for sharing the pro's and con's about being published but Congrats! The book looks fantastic and I hope I have the chance to get my hands on a copy! Thanks for the wonderful giveaway! i would love to win a copy of this book. Looks like there are so many great quilts in it. Of course your Mom showed it around! It does sound like a lot of stress to keep all those deadlines, thank you for the tips and inside info, and the giveaway too! An interesting and informative review of your process. Thank you so much for taking the time to share. Looks like a great book to try something new for "oldies" like me! Thanks for sharing your talents! Thanks for sharing the info on what it takes to get published. You did a great job. We are all proud of you. I can't imagine the amount of work it takes to create your own patterns. I'm so glad you do it though because I love yours. Thanks for the chance to win. Congratulations! I'm hoping to take the jump into pattern submissions soon, so it was interesting to read your take. Thanks so much for your honest review of the process and the book! I guess I am with you: inspiration through books (or blogs) is the main thing. Thanks for a chance! Interesting perspective. Thanks for sharing your experience and thanks for the giveaway opportunity! What an achievement - of course your mom was proud!!! Enjoyed your post and am happy for you that you got published. Great job!! Loved hearing your perspective on this, thanks for your honesty! I would love to win this book. So inspirational! Thank you for the chance. Congratulations on being published! I found this post way more interesting than the usual book review. Thanks for the giveaway. Wow! Lots of gorgeous quilts in there. Congrats on being published too.. It looks like a lovely book. And I'm with you, modern quilting is variable and not well defined. 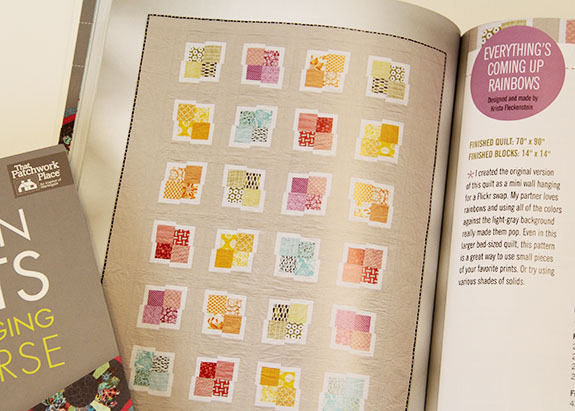 I love the variety of quilts in this book...what fun! It does sound like it was a valuable learning experience, as well as quite thrilling! If I were your Mom, I would be taking your book to work and show it off too! Great job on seeing it through in spite of the challenges along the way. Oh good, I'm glad I'm not the only one that collects those books for inspiration, because I think I've made precisely 2 blocks out of all the books I've bought following the instructions to the letter! Anyway, thank you for sharing your perspective - I think we all imagine it must be glamorous being published, but it always sounds rather stressful to me! Fantastic review! The book looks fabulous.! I would love to have a chance at winning this book. Thank you for your words, its nice to hear "reality" vs advertisments. The book looks very modern - congrats on your design! Thank you for sharing this, it was very interesting. I would think that writing a book would be at least a half time job. As an engineer, I spend a lot of time writing at work, and so I understand sometimes how difficult it is to communicate something in writing which needs to be seen and touched in 3 dimensions. 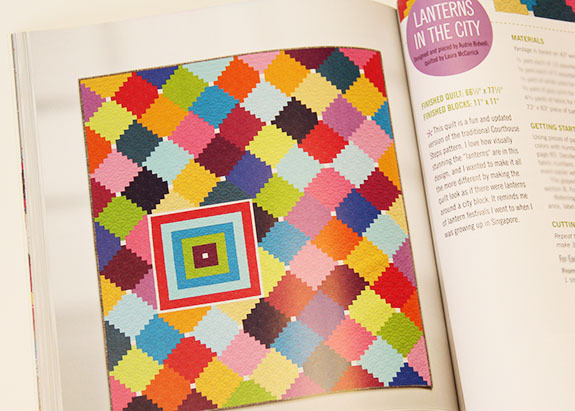 I love looking at quilting books and magazines for inspiration as well. From what I have see this quilt is filled with amazing quilts. I would love to win a copy, thanks. Thank you for candidly sharing your experience with us. Congrats on your publishing successes. OOOOOO, I want to make ALL of these projects!! This book looks so interesting. Thanks for your honest review and a chance for some lucky readers to win a copy. Well, obviously I don't need to win a copy of this book :) but just wanted to comment and thank you for writing this post. Feels good to hear your feelings! Some were/are different than mine, but some so similiar! I think it's very important to hear this aspect of the story. Thank you so much for sharing your personal experience....so real and down to earth. I love your work. Wow, that's quite the experience! My sister told me today that she wants to make some 'modern' things for her one daughter and I think this book would be marvelous for her. If I win I'll send it to her. Thanks for the chance to win. Wow, I thought writing patterns sounded like fun, too =) I can see things from their viewpoint though. The company publishing the book would need the changes back quickly so they can get the book out. Thanks for a very informative look at getting published. I love how you focused on the positive outcomes for you. Thanks for the chance to win a lovely book. Writing a book is a lot like giving birth. After enough time has passed, you seem to forget the not-so-wonderful parts and appreciate the outcome. Give it some time, and you'll likely be ready to do it again. And thank you for the opportunity to win a copy of your book. It looks lovely. Congratulations. Very interesting post...I've wondered what it's like to be part of a book like that. Thanks for sharing. Love your quilts! Oh I loved this I post! Some very honest words and experiences in there...our hobbies should be enjoyable, not stressful, but I also glad that the stress panned out to give you and your family such pleasure to see you in print! That is quite an accomplishment and Congratulations! Very interesting to read about your process and experience. Thanks for sharing! I would so love to have a copy of this book! Congratulations your quilt in a book, amazing. It was interesting to read of the highs and lows of publishing. Such a gorgeous book! I can't wait to check it out! Good for you! Most of us just dream, but you have done it, even if it was stressful. Great post, I loved reading about your experience! Your quilt is beautiful! Interesting comments on your experience. I would really enjoy a copy of this book. Congratulations! I agree with all your comments on the stress and excitement of being published! How exciting to be published! 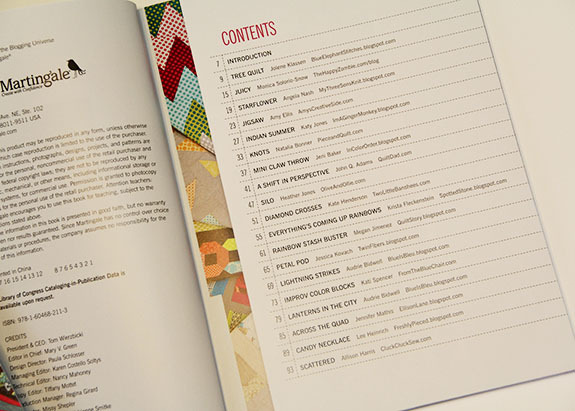 Thank you for sharing your being published and becoming a designer experiences. Great info about your experience-so glad you stuck with it and are now published. Thanks for the giveaway. Great story, thanks for sharing it. I would love to have a copy of this book, it has some wonderful quilts. It must be so exciting to get published. Congratulations. Thanks for the chance to win. Congratulations! Thanks for sharing your experience with publication. Although that is definitely not something in my future, it's interesting to know more about it. Congratulations! Thanks for the opportunity to win this nice book. I'm amazing at what you are able to accomplish, having three little kids of my own. You are remarkable, and I love your quilts. I would love a book. It's jumping off point for things - not only quilts - I make. Great hearing more about your experience Kati!! Looks like a great book! Great blog post and great book! Congratulations! Solid advice! If you don't ask, you'll never know! I enjoyed reading about your experience with regards to publishing. It is always interesting to read about someone's experiences. Thank you for the chance to win a copy of the book and congratulations on being part of it. Congratulations! How exciting for you and it's been fun having a little glimpse of what it's like to be published. Thanks for your honesty, I think it's easy to get caught up in the glamour of the idea of writing a book, when the reality can be quite different. Thanks for the giveaway!